Late last week, DOT completed the installation of gravel epoxy sidewalk extensions in the Financial District along Broadway and Whitehall Street, from the area surrounding the famous bull statue south to an existing plaza between Pearl and Water streets. The additions feature planters and flex-post to keep drivers out, but no seating. 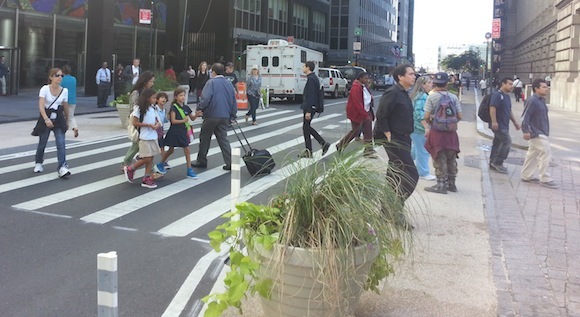 Before the sidewalk widening, DOT counted 390 pedestrians walking in the street south of Stone Street during the peak afternoon hour. Food truck operator Houda Elali said her truck was back to its usual location on Friday after construction wrapped up on Whitehall Street. “It’s not bad,” she said. Saying that she preferred the gravel epoxy to the usual blacktop, she added that the expanded pedestrian space is useful. “Lots of tourists come through here,” Elali said. Do they plan to later truly widen the sidewalk here? True to form, an NYPD car was parked today in the brand new plaza just north of the bull, protecting tourists from some vague sort of terroristic threat and forcing pedestrians into traffic. 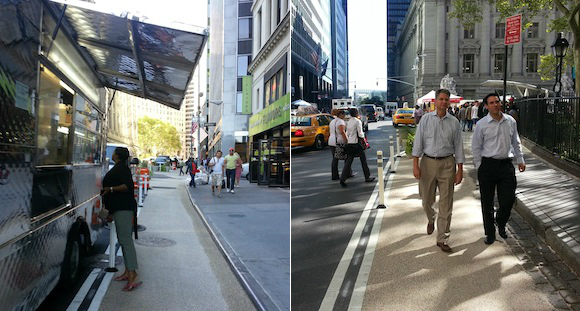 32nd Street Finally Has Enough Space for Walking. Will It Last?